Old man winter has gripped South Carolina by the nape of the neck and refuses to let go. Yes, we are well into our second day of a massive snow storm that may have freezing rain and the dreaded “I” word – Ice – attached to the tail end of this unwelcome visitor. And I should be out and about, getting prepared to decorate for a big Valentine’s Banquet on Friday night, instead of being stuck at home wondering if it will be have to be postponed. See, I’m not a winter person at all. I’m a summer person. I like long, hot days! Once Christmas has waved goodbye, I’m done with winter, but winter is not done with me. I realize that our snow storms are laughable to many, but the problem we have is that we are not equipped to handle snow at all. We may go two or more winters without seeing a smidgen of the white stuff and then have a winter like this one – our third snow storm of the season. As soon as the weather reports mentioned the word snow, the grocery stores immediately sold out of bread and milk. My husband cranked up his smoker and went on a smoking rampage, smoking everything from smoked sausage to brisket. He will not run out of meat in case we are plunged into a world without electricity. And last night was the perfect night for me to make my hobos! Actually, it’s the first meal I’ve prepared since I had surgery last week. I’ve been making hobos since my all-grown-up children were little tots. 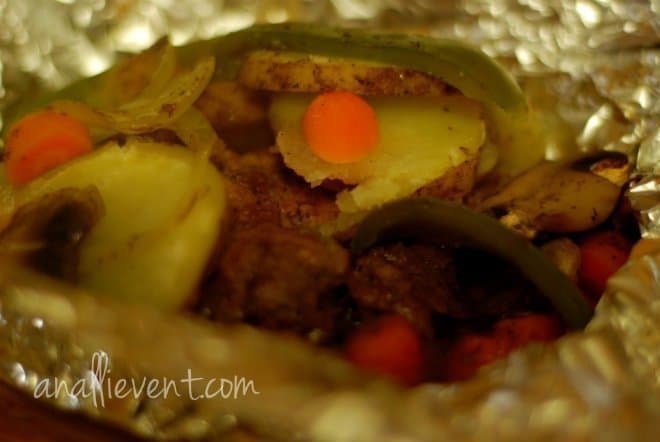 It’s an easy, complete meal all wrapped up in it’s own little foil packet. And clean up is a breeze. Just like summer time and me, hobos and snow storms are made for each other. Enjoy! Preheat oven to 375. Tear off 6 large squares of aluminum foil. Make 6 ground chuck patties and place one on each foil square. Season with garlic salt and pepper. 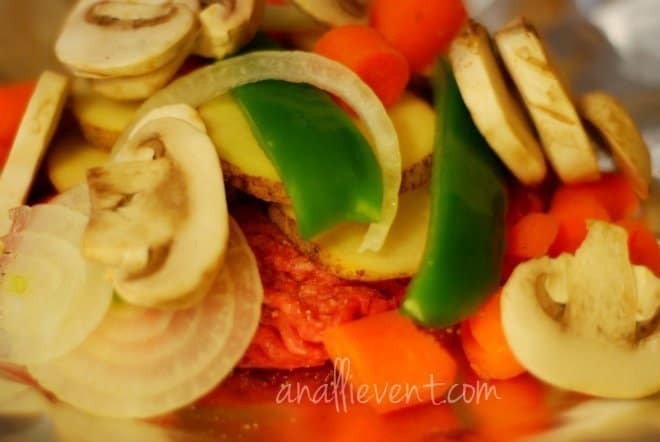 Layer veggies on top and add a pat of butter and another sprinkling of garlic salt and pepper. 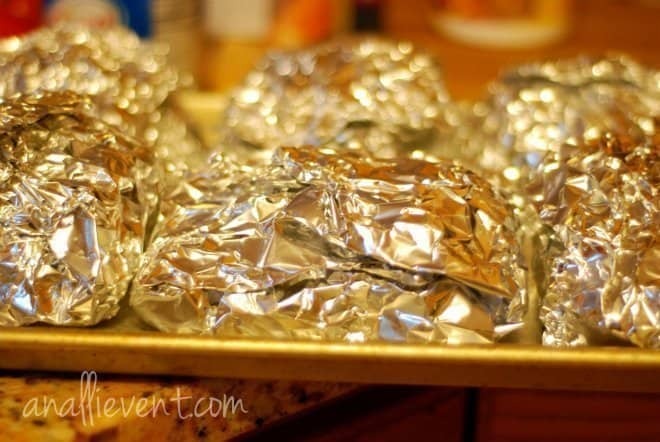 Fold the top of each square of foil so that the food is completely covered. Bake for 45 minutes to an hour, until meat is done and veggies are tender. I love hobo dinners. My mom always made them but I haven’t in years! She always added a bit of cabbage too. These sound sooooooo good. I need to make these soon. Maybe for my Grandma’s Birthday. She’ll be 90 in a few days. Yes, ice is very dangerous! So far we are just having lots of snow, but they are calling for ice, as well. I have made these before but I put a spoon of cream of mushroom soup on each one. It is a change but good. I have also used pork chops instead of ground beef. That sounds good, too – the cream of mushroom soup and the pork chops! Last night when I made them, I skipped the beef on mine and just had a veggie one. My Mom used to make packets of sliced potatoes and butter on the grill. Yum! Here in the Northeastern PA we have just gotten 12″ plus of snow and now it is raining and sleeting too. I live in outer center city of a mid size town in PA, there is no where else to put the snow when you shovel. In my alley behind my home, there is two huge piles of snow on either side of my garage and across from there is the side of a house where crabby people live. It’s okay for them to park in front of my garage, but heavens if I toss one shovel full of snow on their sidewalk that they do not even shovel. Anyway, I think that everyone is ready for Spring. Thanks for letting me vent. Be safe. I haven’t thought about this recipe in years. I made these for a 4-H demonstration contest when I was in 4th grade. I loved it when my mom let me make these for my family. This is an old one, isn’t it? I had not made it in years until the other day my husband said, “You know those little packets you used to make when the kids were little? I sure would like to have one.” I had not remembered how easy it was to make and how flavorful.